We here at Lost Spheres love shapeshifters. Conceptually, the group of characters that encompases the ability to take on another form is pretty broad particularly including third-party options. With so many choices out there we thought some of you wouldn’t mind a few suggestions for your next morphic champion. The extended barbarian archetype of the masquerade reveler (from Rite Publishing) is technically NOT a shapeshifter (though your GM might let you call it one) but criterion for criterion the evolution granting masks of this take on barbarian nearly exactly match the shapechager concept. Over the next week or so we’d like to showcase a few different ‘shifter character concepts from third party companies for those looking for a little change before the new year. Welcome to the 12 days of Shift-mas! Under the Tree – A couple of dazzlingly complex puzzle boxes. The mask and masquerade (evolution granting alternate to rage) abilities of the ‘reveler is going to require a bit of bookkeeping as that each mask (and you gain one every level) gives you a set of different evolutions in a manner similar to eidolon or metamorph. You can even take feats that allow more benefits for shifting masks rapidly in combat, gaining new powers from round to round is highly encouraged. The play style can be super fun but it is NOT always the most beginner friendly concept. Battery Life – Spinning phosphorous. You are looking at masquerades following a rounds per the rage ability and suffer a similar usage limitation. Burn bright dancer, but be careful if the rounds go too long. And watch the fatigue. Otherwise enjoy brilliant flashes of near perfect variability. But starting at 7th level you do get to keep a little bit of power from mask to mask. Wrapping Fees – Masquerade IS rage more ore less and this means rage powers, rage feats, and all other things rager-ish-y! There are some great tools in that box to further a shapeshifter concept masquerade reveler. Add a few class specific feats and this is a nicely supported class with a great (if not required) feat options. Under the Mistletoe – Ball and chain. While this archetype might pair well with sorcerer and rage caster prestige class, it does plenty fine within its own walls. At 11th level each mask gains 2 more evolution points and that is a hard thing to pass on! Still, either approach could add some fun non-shifter shifting to your class. You might want to just to stick with it, even if the grass looks greener. Comeback tomorrow for the next Present of Shift-mas! Day 4 – the Thaumaturge?! 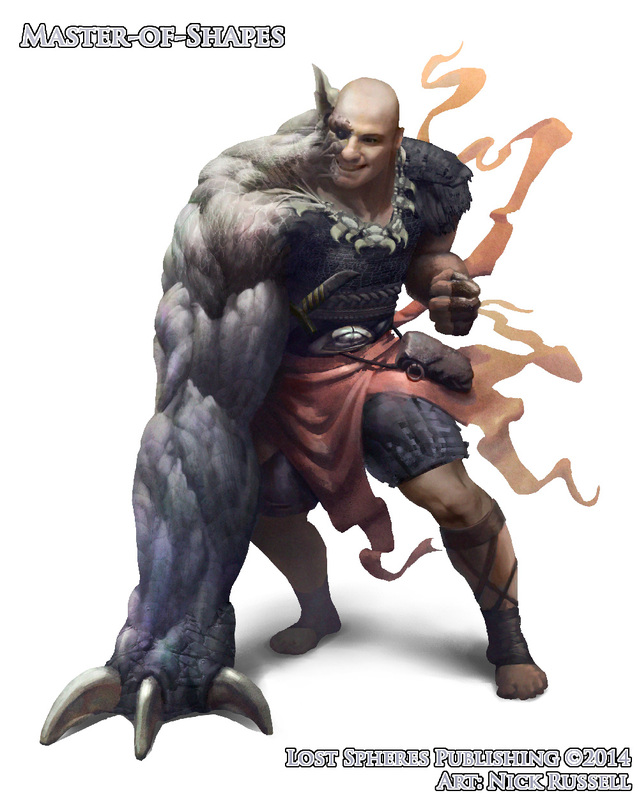 Don’t forget ANY shapeshifter can benefit in Mythic games from the Master-of-Shapes path from Mythic Paths of the Lost Spheres and you can get it on: RPGNow or Paizo or d20.pfsrd.com! This entry was posted in 3rd Party Options, Game Mastering, Lost Spheres, Mythic, Pathfinder Roleplaying Game, Player Advice and tagged 12 Days of Shift-Mas, barbarian, masquerade reveler, Master-of-Shapes, rage, Rite Publishing, shapechanging. Bookmark the permalink.